Blizzard has confirmed that the game creation limit will be reinstated and finely tuned to battle bots. A community manager took to the forums to explain that the limit is coming back and that if you find yourself locked out of the game for any reason you can just ask Blizzard and explain why you made so many games and they might let you play. Oh yeah, and item duping has returned...but we'll get to that in a bit. The use of bots not only impacts the stability of the game service, but it also has an impact on the player-driven economy. While we regularly take action against accounts for the use of unauthorized third-party programs and bots, this additional measure will help us further preserve and protect the integrity of the game and economy in between ban waves. Once this change goes live, we're looking for your feedback to help ensure that the limit is working as intended. If you encounter the "Input limit reached" message and feel you should not have, please let us know how many games you were creating and why. This information will help us ensure the limit minimally impacts legitimate players while still protecting the game against bots. We'll continue to tweak the game limit as necessary, as well as continue to go after the few cheaters and botters that are out there in other ways. Our goal is to help ensure that Diablo III continues to be a fun gaming environment for all of our players, and we're looking forward to hearing your feedback on this change once it goes live. We will update this post and unlock the thread once game limits are re-enabled. I just can't get over the part "If you encounter the "Input limit reached" message and feel you should not have, please let us know how many games you were creating and why." Seriously? Is this what gaming has turned into people? You now have to gain permission from the developer to play the game you paid $60 for, if you get locked out of the game? And then you have to explain yourself as to WHY you may have been locked out? Is this real? The article about Diablo III's authoritarian service is looking completely real with statements like that above. There's no need to even spin anything out of it. I almost feel sorry for Diablo III players. Many of the fanbase are expressing dissent across multiple fansites and online communities, saying that they're willing to hang up the adventuring gauntlets and try something a little less insulting to the gaming community. The Xfire stats seem to reflect the aforementioned sentiment, with a sharp drop-off happening since the game's launch in May, and Gametrics reporting more than a 65% decline in the userbase. I am not sure if Diablo III is in that much of a rut. This was very much a business model where you sell the product for $60 to millions of people. Diablo III in North America made more money in its first week of launch than all the free-to-play games combined. It doesn’t matter if usage drops off. I fully expect Blizzard to release several expansion packs that will sell millions of additional copies. Diablo III has been the biggest success story of the year so far. But does this success story have a happy ending or will it turn into a fairy-tale nightmare? Decisions like the game creation limit, which effectively reduces the amount of times a player can log-out and log back in will surely bungle the playing experience of anyone who has a shoddy internet connection or players who don't have a stable connection to Blizzard's servers. Added to this, there's still the mounting issues involving the Real-Money Auction House and real people losing real money. I just don't see how these kind of services benefit the gaming community. Creating a totalitarian style gaming environment with always-on, restrictive DRM and a loot-grind that centers around a Real-Money Auction House just seems to defeat the purpose of having fun. I see why the Korean Government banned the possibility of virtual item trades for real money as well as locked out any possibility of the RMAH going live in South Korea. What's worse is that Blizzard blatantly lied and said that the RMAH, always-on DRM and restrictive services were put in place to stop hacks, cheaters, botters and item duping. The last of which is still occurring, as indicated by screenshots showing items with identical stats here, here and here. The items also sold quickly, which a player was able to screenshot before the items were completely gone from the auction house, which you can view here. What's more is that the duped items were also spotted on a live stream at Twitch TV, just fast forward to the 2 hour 25 minute mark. We managed to grab the screens but not the details on how to dupe, due to the original thread detailing the item duping process was deleted by Blizzard. The exact details of the procedure is still sketchy so we'll have to update the story when more info becomes available. 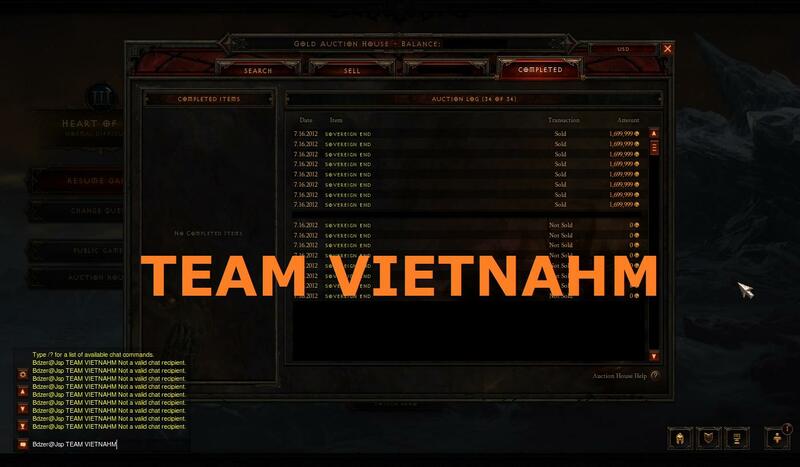 If anyone has a cache of the item duping thread before it was deleted, feel free to forward it our way. This exact same issue also happened earlier in June as well, which prompted for a hotfix and a weekend shutdown of the Asia server. I'm just curious how much more players will be willing to put up with this until they say enough is enough?